The Appalachian Trail is a 2,200-mile hiking trail that extends from Georgia all the way to Maine. 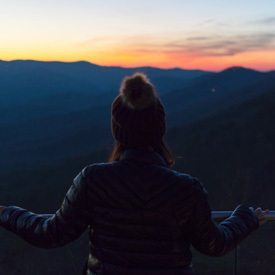 The A.T. is home to some of the most beautiful views in the United States, but presents some hazards as well: severe weather, mosquitos, chiggers and importable water for starters! Be prepared for anything that can happen on the trail with this quick list. What do I need to pack for an Appalachian Trail trip? 1) Shelter – It is a bare necessity to have a tent or hammock with you on the Appalachian Trail. A hammock sounds idyllic, but once the temperatures reach that dreaded low at night time, you’ll wish you had a cozy tent. You’ll use it every single night on the trail, so make sure it’s a durable wilderness-grade one like this. 2) Backpack – The backpack options on the market today are almost limitless. When you’re searching for the right one to bring on a long multi-week hike, finding the right fit is key. This one has an internal frame, which places the weight of your bag in a comfortable way. My best advice if you’re short on money would be to try on a bunch at REI, figure out what measurements and styles suit you, then find a cheaper alternative online. 3) First Aid Kit – You should never start a backpacking trip (or day hike, for that matter) without a first aid kit. On the Appalachian Trail you will probably encounter loads of bugs that’ll bite you, sticks that’ll trip you, and loads of other hazardous annoyances. Keep band aids as well as the big guns with you – emergency splints, instant cold packs, and gauze. You just never know. 4) 15-20 degree Sleeping Bag – Like your tent or hammock, you’ll be using your sleeping bag every single night on the trail. A lightweight one should do, but make sure you buy one that can be compressed as small as possible. This one is perfect for your trek. 5) Sleeping Pad – On the road you might find yourself having to sleep on some less than satisfactory surfaces, like on the dirt ground littered with little branches, or even worse – gravel. A lightweight sleeping pad won’t weigh you down, and you’ll definitely thank yourself for bringing it when you feel that extra layer of comfort. If you’re in it for the long haul, one of these things is key! 6) Clothing – Look for clothing that has quick-dry or sweat-wicking in the name. Absolutely no cotton! Cotton absorbs sweat (and any other liquid) so you’ll get smellier faster. Not to mention, you can find yourself in a life-threatening position if it’s chilly out and you’re hiking in a wet shirt. 7) Hiking Shoes: Women’s and Men’s – Your hiking boots will be your best friend and your worst enemy on this hike. Make sure you get some with ankle support, and make sure you get them in the right size. Your boots should leave enough space around your foot for you to wear wool socks. These ones are my favorite, and have taken me around the world and back. 8) Water Purification System – There will be stretches of trail in which potable water is quite scarce. And as we all know, your body needs to stay adequately hydrated to stay healthy and active. Bring along a water purification system like this one so that you always have a backup plan. Don’t risk drinking untreated lake or stream water unless you want a parasite or stomach bug. 9) Water Bottle – Bringing a water bottle is another important part of staying hydrated. This one is a good size, and can slide into the pocket of your backpack. Make sure to fill it up with drinking-quality water every time you see a spigot. 10) Waterproof Stuff Sacks – Rain and condensation is inevitable on the Appalachian Trail. Keep all your stuff dry (especially your sleeping bag!) by storing everything in your backpack in dry bags. If you’re bringing your phone or camera, this is extra important. 11) Physical Guidebook or Map – Sure, you have Google Maps on your phone, but technology just simply isn’t nearly as reliable as a good old-fashioned map or guidebook. A solid guidebook will tell you much more than a digital map. This one is small enough to fit in your pocket and will keep you updated on all things Appalachian Trail. 12) Toiletries – Don’t let your hygiene slip (too much) while you’re on the trail. You need to pack super light, so products that multitask are a great idea. This Wilderness Wash is my number one backpacking toiletry item. It’s shampoo, body wash, dish wash, and laundry detergent all in one. Consider your hygiene sorted. 13) Hiking Poles – The more challenging uphill and downhill sections of the Appalachian Trail will have your knees aching and thighs burning. Using hiking poles will help distribute your weight off of your legs by letting your arms do half the work. If you want to have better balance and save yourself from soreness, invest in some poles like these ones. 14) Solar Charger – Needless to say, outlets are nonexistent in the great outdoors. Disconnecting is great, but there will be times that you absolutely need to charge your camera or phone. Bring a solar charger so that you never have to worry about running out of juice. 15) Headlamp – Early mornings and dusk call for headlamps. There will be countless times when you’ll need to put up or take down your tent in the dark, and you’ll need light (and both hands) to get it done. A good headlamp is necessary, and you’ll use it much more often than you think. 16) Multi-Tool – Maybe you need to open a can of food or maybe you need to cut free a tangle of cord from your backpack. You never know what kind of tool you’ll need out there on the trail, so bring one that can do everything. This tool has a million uses, but packs down small to save space. 17) Cookware/ Stove – A long hike means a big appetite. Bring a lightweight propane stove that you can easily fire up to cook your meals. This one is trusted by hikers all over the world, and isn’t too heavy to hike with. Always wear synthetic fabrics, so that they don’t trap moisture. A solid synthetic short-sleeve t-shirt is a good idea. Make sure to bring a midweight synthetic or fleece long-sleeve top to layer on for when it gets chilly. Always be prepared with a wind/ rain jacket that packs up small. As far as pants, lightweight synthetic trekking pants (zip-offs) are best. Athletics shorts work too! Depending on the season you’re hiking in, consider bringing a down jacket. Don’t forget wool socks (two pairs), underwear, a wool hat and a sun hat. 1) Too much stuff in general – The lighter you pack the better you’ll feel and the longer you’ll hike! 2) Cotton clothing – Always wear synthetic fabrics. Sweat-wicking and quick-dry are the key words. 3) Deodorant – You’re going to be smelly no matter what. 4) Denim – Denim is your worst enemy – it’s bulky, heavy and does not lend well to exercise. Leave the jeans at home! 5) Bulky sleeping bag – With so many compressible options available now, save your precious backpack space for other items. 1) How much will thru-hiking the trail cost? The Appalachian Trail Conservancy advises $1,000 per month for the average hiker. Taking into account the average completion time (five to seven months), your total can end up being $5-7,000 per person. 2) What if I see a bear? If you end up face to face with a bear on the trail, or at your campsite, stop what you are doing and stay calm. Back away very slowly in the direction you came. Walk, definitely don’t run, and keep your eye on the bear. 3) Where is the beginning of the trail? The trail starts in Fannin County, Georgia at Springer Mountain and ends at Maine’s Mount Katahdin. 4) How long does it take from start to finish? The average completion time is five to seven months to do the whole trail. Lots of people do sections of it during their summer breaks, and make a lifetime project out of it. Some do it all in one stretch. 5) Is the Appalachian Trail dangerous? Well, yes and no. It’s not known for much danger, per se, but it’s known to have plenty of wildlife and can be a tough trail for beginners. Research your route, follow local park and wildlife guidelines, and you’ll likely have zero trouble staying safe on your journey.